Hi there! Today’s post is about Anna Sui‘s Flight Of Fancy Eau de Toilette. I’ve been wearing this fragrance on and off for over a year now, so I thought it’s time for a review! Alrighty! This fragrance contains the following notes: litchi, lemon, yuzu (top notes), freesia, rose, magnolia (heart notes), and amber, musk and woods (base notes). I think Flight Of Fancy is a wonderful summer fragrance. It smells of sunny lemons with a touch of freesia. It’s fresh, full of energy, summery, yellow and happy. If you’ve ever wanted a fragrance that’s a mix of D&G Light Blue (which is lemon-fresh) and J Lo Live (which is incredibly juicy), this is it! Anna Sui‘s Flight Of Fancy Eau de Toilette is available as 30, 50 and 75ml Eau de Toilette. In addition, Anna Sui does seasonal gift sets with matching body products! Hi there! 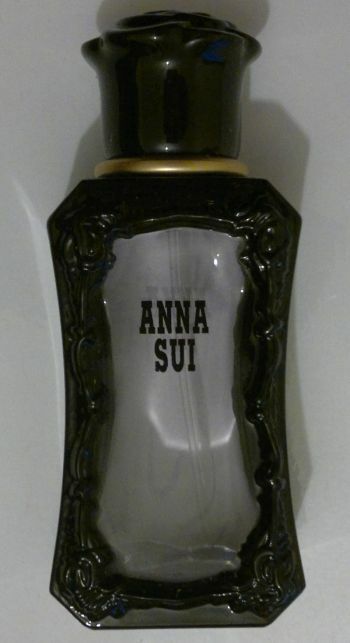 Today’s post is about Anna Sui Eau de Toilette, a.k.a. Anna Sui Anna Sui (! ), Anna Sui Original or Anna Sui Classic. This fragrance for women contains the following notes: raspberry, apricot and bergamot (top notes), Bulgarian rose, desert jasmine and iris (heart notes), and cedarwood, sandalwood and powdery tonka (base notes). What’s the fragrance like? I’d describe it as a powdery, yet transparent iris fragrance. Based on what I smell I’d guess it’s 80% iris, 10% rose, 5% lilac and 5% powder. I don’t get any of the fruity or woody notes. I think Anna Sui Eau de Toilette is a great spring fragrance. It’s also office-safe (pleasant floral fragrance, no big “cloud”). I’d recommend it to anyone who likes powdery floral fragrances! Anna Sui Eau de Toilette is available as 30ml. I paid £13 for my bottle (reputable online shop through ebay).